Ask the seniors at Coeur d’Alene Charter Academy what sets them apart from other public high school students and they’ll tell you: They’re survivors. They’ve watched their class shrink from more than 120 students to just over 40. Above and beyond is the standard for Coeur d’Alene Charter Academy, a public charter school that serves students in grades 6-12. The school has piles of accolades: It has earned five stars, the highest school ranking, from the Idaho Department of Education. In 2014, the Washington Post named it Idaho’s most challenging high school — again. Newsweek has ranked it one of the top 20 public high schools in the West. U.S. News and World Report has ranked it among the top 100 high schools in the country. Yet it’s also a school in transition. The Coeur d’Alene School District, which has authorized the school since its inception in 1999, decided to cut ties with the academy in 2013, citing financial considerations. The academy recently applied for authorization with the Idaho Charter School Commission. It’s been a long process, says Principal Dan Nicklay, but the school is sticking to its singular focus: Academic success. The academy was founded in 1999 by Bill Proser, who still teaches at the school. From the start, the school attracted teachers, like Nicklay, who saw the potential in Proser’s vision of high standards and independence. Nicklay came to the academy from Montana in its second year to teach English and literature. Back then, the entire school was housed in a building that had previously been a pet store. The walls didn’t reach all the way to the ceiling, so students and teachers could hear what was happening in other classrooms. The academy’s playing field was full of rocks. The second school year commenced with about 200 enrolled students. By the end of that year, only 140 students remained. At first, Nicklay says, not even all of the parents were on board with the school’s rigorous standards. Teachers are free to teach college-level lessons in the eighth grade, for example, and many were concerned their children couldn’t handle the advanced pace. In Nicklay’s own class, most of his students started the year earning Ds. By the end of the year, he says, most of the students were earning As and Bs. But performance begins with the academy’s teachers and its traditional focus. Students are required to take Latin, and there’s a heavy emphasis on Western Civilization, the humanities, foreign languages, math and science. One hundred percent of the students take advanced placement classes. Nicklay recalls one of his conversations with Proser when he arrived at the academy. The school has stood by that mandate, shunning any sort of standardized teaching method. Instead, Nicklay says, teachers are encouraged to pursue their own gifts and use them in the classroom. “What we’ve discovered is that when you push kids and demand much of them, they will perform,” he says. Nicklay stresses that the school isn’t exclusionary; it’s a public charter school and is open to everyone who wants to enroll. He cites the academy’s success with autistic students, for example, as well as other students who were thought to be poor performers, but when challenged academically rose to the high standards expected of them. There are other standards that set the academy apart. Students are expected to stick to a strict moral code. Student Becca Mann was a bit surprised when she arrived at the academy. There is also a dress code, though some students try to flaunt it by wearing colorful scarves or changing their hair color; if caught, those students face detention. “After we graduate we all dye our hair and wear the craziest clothes,” Mann says. No money is spent on sports, though the school does have sports teams. Parent volunteers drive students to and from games, Nicklay says. If students want new uniforms or equipment, they have to raise the money themselves. “Every dime we spend on basketball is a dime we don’t have for books,” Nicklay says. Evidence of the school’s college prep focus is everywhere. The high school’s entryway includes university pennants from around the country with the names of students who have attended listed underneath them. National Honor Society minutes are posted on the wall. Ninety-nine percent of the school’s students go on to higher education, DePew says, and college admissions counselors visit the school every week. Like other public schools in Idaho, Coeur d’Alene Charter Academy took a financial hit when funding dwindled during the recession. That hasn’t affected its success. Funding has changed the way the school operates, though. When the school was founded in 1999, the Idaho Charter School Commission didn’t exist; the law dictated that public charter schools had to be authorized by their districts. In 2012, the Idaho Legislature amended the law so schools could instead be authorized through the Idaho Charter School Commission. Districts had the opportunity to continue authorizing their public charter schools, but the Coeur d’Alene School District chose to sever its ties with the academy. Handelman calls the process an “amicable divorce” that made sense both practically and financially. Had the relationship continued, the school district would have had to cover the cost of providing care to the academy’s special-needs students at a time when “we don’t have enough staff to cover our own kids,” Handelman says. There were other potential liability concerns about accidents, for example. “Are we the deep pocket as their authorizer?” Handelman asks. The academy is now applying to the Idaho Charter School Commission for an authorization transfer. The commission asked the academy to make some slight changes to its transfer petition during its December meeting and is expected to give its ruling on Feb. 12. Nicklay is confident the transfer will be approved. The school is proceeding with plans for the future. DePew says he would like to focus on infrastructure, replacing old “falling-down” modular classrooms and expanding the school’s classroom space. And Nicklay says the school will always keep its focus on being the best. This is the sixth in a six-part series featuring Idaho charter schools. The first was about Boise’s Anser Charter followed by features on White Pine, Syringa Mountain in Hailey Heritage Charter and I-DEA. 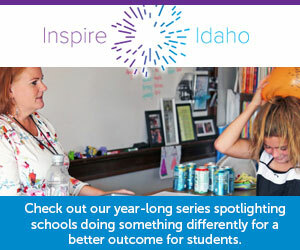 This series is being provided by the Idaho New School Trust, which is funded by the J.A. and Kathryn Albertson Foundation. Disclaimer: Idaho Education News is funded by the J.A. and Kathryn Albertson Foundation.